The meaning of the title, Three Minutes Off Okinawa, never gets explained, but the rather long subtitle, The Sinking of the Radar Picket Destroyer the U.S.S. Mannert L. Abele by Japanese Kamikaze Aircraft, summarizes well the contents of the book's second half. Mannert L. Abele (DD-733) lost 84 crewmen when two kamikaze aircraft hit the ship off Okinawa on April 12, 1945. A Zero fighter first hit the destroyer, and then its delayed-action, armor piercing bomb exploded, breaking the ship's keel and causing 55 deaths . Just a minute later, an ohka (piloted rocket-powered glider bomb) hit the starboard waterline in the forward fireroom causing a huge explosion that resulted in 22 men dead. The remainder of the total 84 dead lost their lives in the water after the ship sank. Abele's electronics officer, Roy S. Andersen, gathered together the stories of about 50 former crewmen through interviews and written accounts. This history combines their eyewitness accounts of the kamikaze attack and its aftermath with background information about destroyers, Abele and her crew, and Japanese kamikaze. Chapter 1 gets right into the action with a simultaneous attack by five Japanese aircraft on April 3, 1945. Two kamikaze aircraft barely missed the destroyer, and the third aircraft escaped after dropping a bomb that missed. Inexplicably, no mention is made of what happened to the other two of five total aircraft. 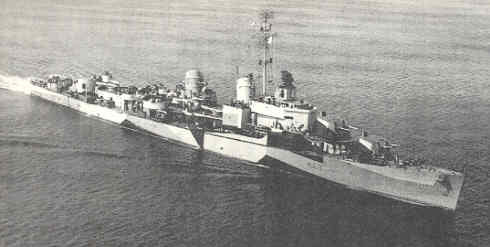 Chapters 2 to 4 introduce Abele, her crew, and life aboard a destroyer. The book has many photos of destroyers, decks, and compartments, but these come from other destroyers, whereas the book only has two photos of Abele and a few personal photos of her crew. The book's first half includes a background chapter on kamikaze and another on the ohka weapon. The author only briefly covers Abele's history from her commissioning in July 1944 to her arrival at Okinawa in late March 1945. The last half of the book's 35 chapters cover in detail the attack by two kamikaze aircraft, the ship's sinking, the crewmen's time in the water, their rescue, and their trip back home. The book has 11 appendices, including texts of citations for medals and awards to personnel of Mannert L. Abele. The end of the book also has a glossary, bibliography, notes, and extensive index. Heroes and heroism were everywhere Thursday afternoon, and space does not permit to give the due honor to all, but the conduct of Doctor Hertner was representative and surely exceptional. The Doctor joined a raft on which there were several men and took charge. The firmness and coolness of his command instilled confidence and kept the morale of his fellows bolstered. During the hour and a half that his raft was in the water he paddled about, assisting in the rescue of wounded men, although he cannot swim. Since the raft was upside down the first aid kit was inaccessible. Fortunately, however, a kit was picked up which had been blown from the ship and the Doctor administered Morphine syrettes to Kirsch, who was brought aboard the raft badly burned. On the LSM the Doctor immediately went to work treating and bandaging the wounded. When we were transferred to the DMS, he continued without let-up. He and Doctor Byrne of that ship worked through the night until the transfer was effected to the GOSPER. The rest of that night and all the next day he got no sleep, going to bed for the first time on Friday night. The background information presented by the author on Japanese kamikaze and ohka has a few mistakes. He incorrectly gives the definition of ohka as "exploding cherry blossom," whereas its meaning is just "cherry blossom" (p. 112). The Thunder Gods (Jinrai Butai in Japanese) and the Special Attack Corps are erroneously portrayed as being the same group (pp. 109-10). The Thunder Gods only included Type 1 (Betty) Bombers that carried ohka weapons and Zero fighters that carried bombs (Hagoromo 1973, 90-7; Naito 1989, 137-40). The Special Attack Corps included other Navy and Army aircraft for suicide missions and also had explosive motorboats and kaiten human torpedoes. Andersen states that Rear Admiral Masafumi Arima led a strike force on October 26, 1945, but this attack happened 11 days earlier (p. 64). 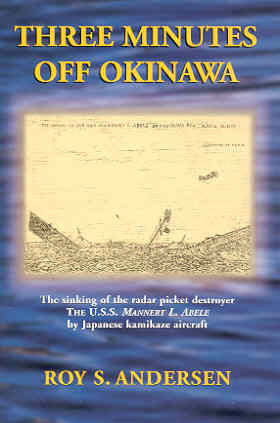 Although many kamikaze pilots who made attacks during the Battle of Okinawa had limited flight training, they had much more than the seven days mentioned by Andersen (p. 65). He states the final three days were devoted to a suicide manual, and Andersen documents his source as Axell and Kase (2002, 77-83). This manual was prepared in May 1945 at an Army training air base named Shimoshizu near Tokyo, but the Navy's Kamikaze Corps would not have used a manual prepared by the Army. Moreover, most of the kamikaze attacks had been carried out even before such a manual became available at that Army air base. The book Three Minutes Off Okinawa provides an excellent example of a former crewman's efforts to collect valuable stories of his shipmates and to record the history of his warship that fought and sank so many decades before. The detailed personal accounts of the kamikaze aircraft attacks that sank Mannert L. Abele can be found nowhere else. 1. Page 137 states that 55 men died when the Zero hit and its bomb exploded, but page 209 gives the number of 52. Axell, Albert, and Hideaki Kase. 2002. Kamikaze: Japan's Suicide Gods. London: Pearson Education. Hagoromo Society of Kamikaze Divine Thunderbolt Corps Survivors. 1973. The Cherry Blossom Squadrons: Born to Die. Edited and supplemented by Andrew Adams. Translated by Nobuo Asahi and the Japan Tech Co. Los Angeles: Ohara Publications.